The Simpsons: Tapped Out Stunt Cannon content update was released on July 26th, 2017, and is the one hundred and fifty-third content update. It is a teaser to the Homerpalooza event. It added 1 decoration. The update ended on July 31st at 8am GMT. Dad, Lisa, come quick! I've found something amazing! The closet where Mom hid all the things she doesn't want us playing with. The samurai sword Grampa gave me! My cannon from when I was a stunt performer at the Hullabalooza festival! No. Not the cannon. Don't you dare place that! Bwanky, I'll never leave you again. System Message Play through the questline to unlock a special animated job for Homer! Homer, please tell me you're not going to repeat your Hullabalooza cannon performance. “If a cannon appears in Part 2, then by Part 5 it must have shot someone in the stomach”. Don't you have a ragged blanket to obsess over? I knew I should've put a lock on that closet where I hide things. Is it Part 5 yet? I want to shoot this thing. Homer, the last time you shot cannonballs into your stomach for Hullabalooza, you nearly died. You're exactly right. And the only solution is padding. By which I mean a beer belly the size of a waterbed. I think I'm ready for the cannon. Homer, be responsible, and remember the slogan. “Don't drink and shoot cannonballs into your stomach”. Only one way to sober up. Eat forty pizzas. System Message Homer's stomach is ready, even if you're not. 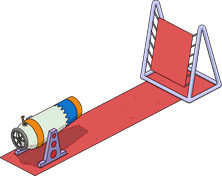 System Message You've been awarded Homer's “Stunt Cannon Performance” animated job! A dinosaur with machine guns for arms? A bloated fat man being blasted in the stomach with a ten-pound iron ball. Eh, next time aim at your skull. In Two Minutes of Hate Pt. 5, Homer's dialogue "Walls of amazing guitars that I will never bother to play in a million years." was changed to "Walls of amazing guitars that I will never be able to play in a million years.". If a user attempts to buy a skin for a building, the dialogue "You must build [building name] before you can use this façade." was changed to "You must build [building name] before you can purchase this façade.". The job Go To Guitar Central Third Tiresome Time was changed to Go To Guitar Central a Third Tiresome Time. Dr. Colossus' Mope job was added back and no longer requires the quest Hector Von Colossus to be started. A glitch making Pride Crosswalk upgradable in other people's town was fixed. Timers for the items in the Superheroes Return store panel was added. The quest Fallout Boys Rise From the Shadows Pt. 1 now expires once the Superheroes Return update is over. Modified on February 24, 2018, at 10:26.